Who is to blame for the failure of the Arab Spring and the rise of Islamic State? Christopher Davidson, Reader in Middle East Politics at Durham University, suggests that the answer might lie far closer to home than we dare to imagine. 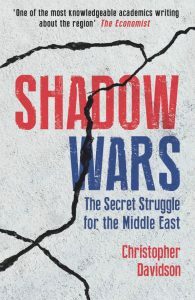 In Shadow Wars, Davidson exposes the Western manipulations in the Middle East that, over the past 100 years, have given rise to religious politics, sectarian war, bloody counter-revolutions and the most brutal incarnations of Islamic extremism ever seen. Chaired by Sian Kevill, journalist and producer.